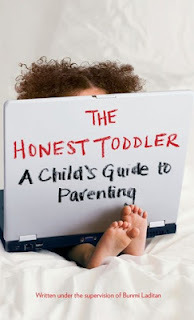 The Honest Toddler: A Child's Guide to Parenting is an Internet sensation created by the oh-so-clever Bunmi Laditan and based on her youngest child—who is "this many" years old, not potty trained, not trying. There is no other parenting guide like this one. Topics include how to handle tantrums, a food shopping guide, bedtime/nap tips, car etiquette, discipline and more. There's even homework assignments to practice new techniques learned from this unique manual. When I tell you I burst out loud laughing hysterically, it is not an exaggeration. I picked up a few tips about toddlers. For example, temper tantrums should be referred to as loud outbursts. And instead of pulling your toddler up by one arm in the middle of the mall, simply pick your child up and abandon errands for the rest of the day. Also, there is no point insisting on inside voices; outside voices win. WARNING: If read in public, be prepared to explain why you are LOL. It happened to me twice while reading! I simply told the people side-eyeing me to read The Honest Toddler to understand why I am so tickled. I am not a parent and still enjoyed this book. It is a funny good read for everyone. New parents will appreciate learning how their toddlers think. Seasoned parents will find it quite entertaining and relatable. And child-less people like me will laugh uncontrollably because we don't deal with toddlers on a daily basis so find the sassy narrator's sarcasm hilarious. I am now including a copy of The Honest Toddler in every baby shower gift. Friends and family, thank me later. The rest of you need to download or purchase a copy. Let the advice within the 200+ pages sink in. I promise you will chuckle and be entertained by the anecdotes. Don't forget to follow The Honest Toddler on Twitter and Facebook. And to the author, Bunmi Laditan, I hope your dream of hiring a full-time au pair comes true really soon. But not so soon that you stop sharing tales of your sassy toddler. Now excuse me while I review my notes on toddler entertainment. I learned a new approach for when my niece, Taylor Tot, wants to watch Max and Ruby, Doc McStuffins and Caillou in a continuous loop. Series Sunday: Guest Post: Tyrone M. Eddins Jr.